Sometimes it’s not easy to motivate yourself to cook on a weeknight. You’re tired from working all day or maybe your kid’s soccer practice ran late. You feel rushed while you’re cooking, rushed while you eat, and then of course there’s the cleanup. You could go out to a restaurant, but that gets pricy. Plus it’s hard to monitor whether what you’re eating is healthy when you’re ordering off a menu. What if you could eat a delicious, healthy meal at home without cooking? No, I’m not talking about frozen dinners from the grocery store. With a little planning, you can enjoy 5 healthy dinners on busy weeknights with very little kitchen time. The deli section in your grocery store is a gold mine when it comes to making life easy on the weekdays. There, you can find meat you don’t need to cook (like deli turkey) and cheese that you can add to a salad to make it dinner-worthy. This chopped chef’s salad recipe takes only 30 minutes to pull together and is packed with protein to keep you feeling satisfied. You can quicken the process even more by raiding the salad bar, which is usually right around the corner from the deli. Grab some prechopped lettuce, grated carrots, chickpeas and hard-boiled eggs. Then all that’s left to do is mix up the dressing. Here’s another secret to easy weeknights: rotisserie chicken. The beauty of a rotisserie chicken is that you can eat it hot or let it chill in your fridge a couple of days and use it throughout the week. I like adding the meat to soups (but not this week—no cooking, remember!). It’s also great for sandwiches, like this super-quick BBQ Chicken Sandwich. It’s similar to pulled pork, but with way less work. Add a salad on the side and you have an easy, no-cook dinner ready in 10 minutes. 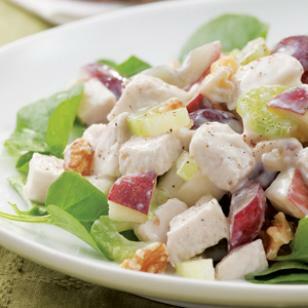 This creamy classic salad uses the rest of your rotisserie chicken. You can serve it on a bed of lettuce, add it to a wrap or eat it with baguette. One note on rotisserie chicken: it tends to be high in sodium. Taking the skin off will slash sodium (and fat), but it still has about 230 mg more sodium per 3-ounce serving than a chicken breast poached in water. If sodium is a concern for you, curb the salt in other places, such as dressings. And skip bread, which can be a surprisingly significant source of sodium. Go ahead and walk the dog. Play with the kids. Do a puzzle. You have dinner ready to go. It’s lasagna night! 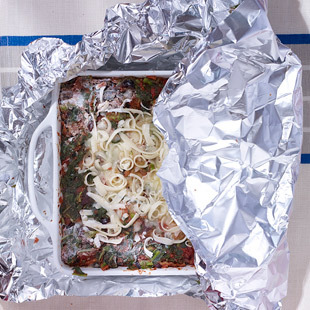 There’s only one trick you have to know about using your already-prepared lasagna: the lasagna needs to be heated THAWED, not frozen, so make sure to take it out of the freezer about two days before you plan to cook it. Like the lasagna, just take this casserole out of the freezer two days before you want to slip it in the oven. Cook it at 375°F (uncovered) for 50 minutes and then enjoy a warm, hearty dinner. And then, guess what, you did it! Five delicious dinners without much major kitchen work or cleanup. This plan is only a suggestion. You can take advantage of any freezable meal. If you want to freeze some and eat some later, just double the recipe. Check out some of our Favorite Freezable Casseroles. Download a FREE Dinner Plan for a Month of Quick Dinner Recipes for Busy Families!